If you’ve been following me for a while, you know I am ALL about keeping things simple and easy while super engaging and effective. I expect my resources and curriculum to save ME time but give the kids as much as possible to help their schema GROW! That’s the reason I am SO excited about No Fuss Interactive Math! The truth is, my district purchased math curriculum is lacking. My kids needed something more. They needed something that made the concepts clearer and helped them build mastery. I found myself having to add quite a few activities to my math block. I began using math journals and it made a huge difference in my students’ concept mastery. I love using journaling to help develop concept mastery. I do not love cutting and pasting during journaling. There is definitely a time and place for cutting and pasting. But for me, it’s not during my reading and math lessons. Using journaling notebooks to help support content and cement student knowledge is not new. Plain and simple, it’s note-taking. It’s been going on for ages. Writing it down helps it stick in your brain. It is a scientific fact. The more students work with new concepts, the better their mastery. Utilizing journaling notebooks allows students the opportunity to take ownership of their newly acquired knowledge. I have my kiddos make quick notes about key elements of the topics we are working on often. It’s never to early to start incorporating those note taking skills! Often, students and teachers get lost in the purpose because the notebook work chosen isn’t focused on content but rather in notebook creating procedure. Far too much cutting and pasting and not enough engagement with the content. I am SUPER EXCITED to share No Fuss Interactive Math with you. It is simple, effective, engaging, and builds mastery without prep and storage tub worries. Instead of a lot of cutting and pasting, students are WRITING and ILLUSTRATING standards focused math strategies. The resource is perfect as a stand alone curriculum or as support material for any math curriculum you may currently use. In all, there are 16 units covering all of the 1st grade math standards. Each unit is filled with goodies to help your students achieve mastery over each standard. The teacher’s manual provides background, support and direction for each component of the program. Additionally, a planner is provided for each unit. This suggested plan details how to work this program with guided, independent and cooperative groups all during the same math block. However, the entire resource is developed in a manner that will suit any teaching style or approach. In all, this curriculum contains 21 different posters! They provide visual reference for each lesson. The anchor charts are as adorable as they are resourceful. I put magnets on the back of them and stick them to my white board. The lessons are QUICK, yet meaningful and strategic. Each No Fuss Interactive Math unit offers dialed in lessons on specific topics. Accompanying those lessons are journaling opportunities that are perfect for intervention, small groups, and guided groups. They can also be done whole group. Sometimes I follow the provided plan with guided groups, independent and cooperative activities. Often I stretch it out. We do some things whole group one day. An activity another. A game or two another. The units can be done in a week or stretched to several weeks! It all depends on you, your teaching style, and your kiddos needs. The journaling component is simple, yet effective. The teacher easily guides the students through the steps of “note taking” about the focus concept. I always tell my kiddos this is what the “big kids” and college students do… they eat.it.up! Snipping the corner off completed pages makes it very simple to find where you left off! No need to thumb through pages to find the next blank page. This works in ALL kinds of workbooks and journals! No Fuss Interactive Math lessons and activities are effective. This resource offers so much more than notebook opportunities. However, if you prefer the cut and paste method, those items are included, too! Copy on plain white paper or multiple colors of paper and have the kids mix and match to create eye-catching notebook elements. While I do not generally use these components during our lessons and journaling time, I love giving them to my kiddos for use during cooperative groups. They utilize the pieces to “teach a friend” the concepts we’ve been working on. So fun AND enriching! I simply put out a tub of elements and give them scrap paper to work with. This is an incredible asset to cooperative learning time! I use Depth of Knowledge and Higher Order Questions throughout the day with all of my lessons. This not only encourages deep thought, it helps cement new concepts into students’ ever growing schema. Every lesson in No Fuss Interactive Math has an accompanying Digging Deep component. These DOK/HOT questions bring value to whole group and small guided group lessons. They offer another form of concept reinforcement, perfect for INTERVENTION and RSP lessons. These questions are perfect for “ticket out the door” or assessment activities, too. Simply have the kiddos use a scrap piece of paper or their white boards to note their answer. These types of activities are perfect assessment tools in all curricular areas. There are 80 different activities in No Fuss Math! They range in difficulty and provide excellent opportunity for differentiation and various use. Usually, I give them to the kiddos as independent practice after we’ve done the lesson and journaling. Sometimes, I save them for a bit and give them a few days after the lesson, to reinforce and revisit. Spiraling back to previous concepts is an awesome way to build concept mastery. Often, I place these types of activities in plastic sleeves and provide them to the students in centers or during “free choice” where they use them with wipe off markers as activity mats. Every once in a while I use the activities as assessments that I collect and grade. The point is… change it up – but keep them practicing! I LOVE center activities and games. Kids learn a lot, build concept fluency and have a great time doing it! Spending hours prepping and buying components for them, however, is not so fabulous. Most of all, I simply do not have the space to store a bunch of games. 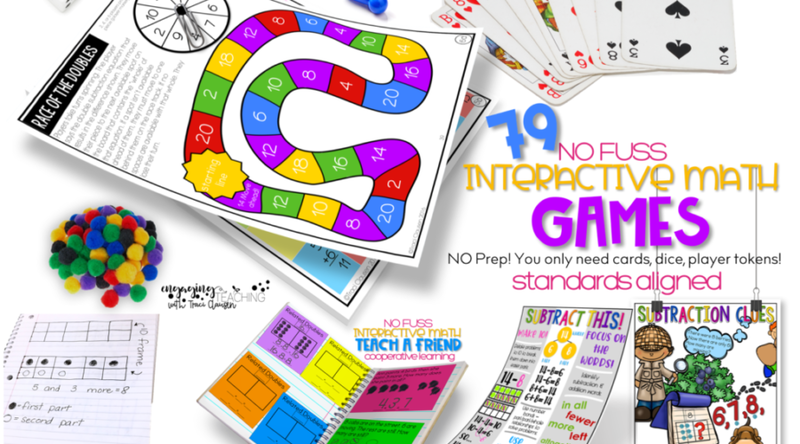 In all, there are 79 games within the No Fuss Interactive Math units. But don’t worry about storage! Each game is one sheet. Just one. No cutting, pasting or even laminating necessary! I place mine in plastic sleeves and keep them in the binder. For each game you may need a spinner (a paperclip and pencil will do), perhaps a deck of cards or some dice. For player tokens, I use pieces from old games, pom-poms, mini-erasers, scraps of paper or even give each student a wipe off marker in different colors! And that.is.it. Easy-peasy! No stress, engaging and effective games. The games are designed for 2-6 players. Perfect for small table groups, free choice time, math exploration tubs, etc. As we know, visual support is essential in any effective classroom environment. My focus wall contains a lot of content for all of our curricular areas. Math is no exception. In all, there are 96 vocabulary cards included in No Fuss Interactive Math. In addition to the word and a short descriptor, the cards are color coded. If a word is RED, the term applies to subtraction. If a word is GREEN, the term applies to addition. Using these colors throughout your math lessons whenever you write a plus or minus sign or use a strategy specific to one of those operations, helps students grasp the “thinking” behind the strategy. Although we want our students to understand subtraction and addition work together, it helps to delineate their opposition to each other. The colors help a lot. This program has everything you need in a simple to implement, highly effective format. Each unit is available separately. Purchasing the BUNDLE will save you 25%!! I love this program and I hope you do, too! Providing students with an engaging ways to attack math ensures a more thorough understanding of the concepts. No Fuss Interactive Math is exactly what my kiddos needed – and me too! I’m thrilled with the no-prep effectiveness and they thrive with all of the interaction! It’s a win-win!! Will you do a third grade interactive notebook like this?